If you have a lot of student loan debt, you may have considered refinancing your student loans. For some borrowers, refinancing could be a great move. But for others, it could be a mistake. 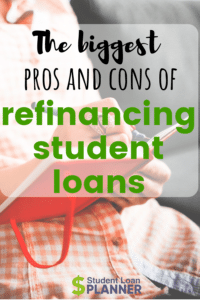 To help you decide whether refinancing makes sense for your situation, read on to see the biggest pros and cons of refinancing student loans. Lower interest rates. Lowering your interest rate could save you a ton of money on your loans. For example, let’s consider a $100,000 loan with a 15-year repayment term. By lowering your interest rate from 6% to 4%, you could save over $18,000 in interest over the life of the loan. A lower monthly payment. If cash flow is a major financial concern right now, a refinance could help you pay down other higher interest debt or save for an emergency fund. A shorter repayment term. Shortening your repayment period by refinancing could save even more in interest costs. Using the same $100,000 loan example above, shortening a repayment period from 15 years to 10 years results in over $30,000 in interest savings! Consolidation. Refinancing consolidates multiple student loans into one so you can avoid managing different terms and due dates. Keep in mind that consolidating federal student loans into one new private loan means losing your federal student loan benefits. A new servicer. Not all student loan servicers are created equal. Some are better than others at customer service, following borrower payment instructions and reporting accurate information to the credit bureaus. If you’re unhappy with your student loan servicer, refinancing gives you an opportunity to show them the door. Cosigner release. You might be able to negotiate a cosigner release on your current loans, but the process can be long and difficult. Refinancing could allow you to get a brand new loan that doesn’t include the cosigner. Extra perks. Private student loan companies do many things to set themselves apart. For example, Laurel Road offers unique options for medical professionals, Earnest has flexible repayment terms and Commonbond’s Pencils of Promise program gives money to kids in developing countries. In short, refinancing your student loans could save you a lot of money and hassle. While student loan refinancing can offer many benefits, refinancing has its share of downsides as well. Here are a few of the cons of refinancing student loans to be aware of before making a decision. No forgiveness options. When you refinance federal student loans into private, you lose out on any chance of receiving federal student loan forgiveness, including Public Service Loan Forgiveness (PSLF). If you have a realistic chance of earning PSLF, you shouldn’t refinance your federal student loans. No income-driven repayment plans. With federal student loan income-driven repayment plans, when your income goes down, your payments do, too. You don’t get that luxury with private student loans. Could take longer to pay off. As mentioned above, some borrowers choose to keep their repayment period the same (or extend it) to lower their monthly payments. This helps with cash flow, but it also means you’ll have a later payoff date and might owe more overall. May offer no deferment or forbearance. Federal student loans have deferment and forbearance benefits that let you pause loan payments while unemployed, enrolled in school or serving in the military. Some private lenders don’t allow you to stop payments for any reason. Credit and income requirements. You’ll need to be in good financial shape to qualify for student loan refinancing. Every lender’s credit requirements are different, but you’re probably going to need a score of at least 650. Lenders also want to see a good debt-to-income ratio (DTI). Aiming for below 40% is a good start. Loss of grace period. Most federal student loans have a grace period of six months after graduation before payments are due. You’ll have to start making payments immediately after a refinance. If your student loans already happen to be private, then many of these cons can be immediately taken off the table. But if you have federal student loans, carefully weigh the financial upside of refinancing against the federal benefits you’ll lose. If you’ve taken out several federal student loans, you can consolidate them via the federal Direct Consolidation Loan program. Like with any consolidation, consolidating student loans through the Direct Loan program can make it much easier to manage your student loan payments. But there are additional pros and cons of the Direct Consolidation Loan program to be aware of. This program could be a good choice for some borrowers, especially those with subprime credit. Federal benefits remain. The good news about consolidating through the Direct Loan program is you don’t lose any of the federal benefits like student loan forgiveness, income-based repayment, and forbearance and deferment. Access to additional federal benefits. If you’re someone who currently has a Parent PLUS loan, a Perkins Loan, or a Family Federal Education Loan (FFEL), you’re not eligible for income-driven repayment plans or PSLF. But by consolidating these loans via the Direct Loan program, you would become eligible for these benefits. Fixed rate loan. If you’re currently in a variable-rate loan, consolidating gives you the opportunity to lock in a fixed rate. No credit requirement. Borrowers with shaky credit don’t need to worry about getting denied for the Direct Loan consolidation program. The program is available to all federal student loan borrowers regardless of your credit situation. While consolidating through a private lender can save you a lot of money, the Direct Consolidation Loan program is really just designed to simplify monthly payments. If your credit is keeping you from qualifying for a private lender consolidation, then using this program could be a good choice. Can’t include private loans. While you can combine both private and student loans when you refinance, this isn’t possible with the Direct Loan program. The Direct Loan program rules only allow federal student loans to be combined. Higher interest rate. The Direct Loan program takes the weighted average of all your federal loans and adds one-eighth of 1%. While that’s not a huge interest rate hike, it’s still something to keep in mind. Clock starts over for student loan forgiveness. If you were hoping to have a portion of your federal loans forgiven, you need to know that no payments made before your consolidation will count. This applies to income-driven repayment plans as well as PSLF. This guide has covered some of the most common pros and cons of student loan refinancing and consolidation. But if you’re still unsure whether a student loan refinance or consolidation is the right decision for you, we’d love to help. During a student loan consultation, we’ll discuss your specific situation to discover your best student loan strategy. Book a student loan consult today. Clint Proctor is a freelance writer and founder of WalletWiseGuy.com, where he writes about how students and millennials can win with money. He lives in Daytona Beach, Florida with his wife and two boys.